OneRx belongs in the “Disrupting” category because the prescription drug market already exists, but we’re completely re-imagining it to put more power into the hands of the patients/consumers. Most people’s experience of purchasing prescription drugs is that they have a single pharmacy near their home or work that they use and their medical practitioner simply sends their script to that pharmacy and they fill it. 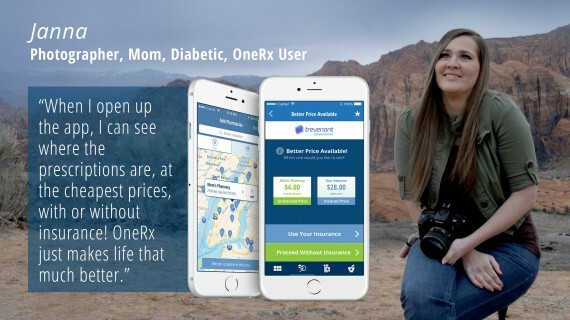 OneRx’s goal is to completely upend that process and allow the user to take control of it by seeing exactly what their insurance covers and/or what the price will be and the pharmacy that will provide them with the best price before leaving their doctor’s office. Price comparing and searching for coupons for prescription drugs are behaviors no one currently engages in part because consumers don’t know they can can and in part because there’s no way for people to easily do so. Now people have access to information that wasn’t available to them before and empowers them to insert themselves into a process that they were previously kept out of. Before OneRx there was no way for people to know what their insurance would cover, how much they’d cover it, or if there would be any problems stopping them from getting their prescription drugs until they arrived at the pharmacy. The simple errand of picking up one’s prescriptions could potentially be a nightmare. Now, there will be no such headaches when people arrive at a pharmacy because they’ll know well in advance what costs and/or issues will be involved in obtaining their medication and can sort it out from their doctor’s office. This everyday errand is also made all the easier by being able to get the lowest possible price for their medications. Price comparing pharmacies and searching for coupons on medications was technically possible, but would be incredibly difficult and time consuming. With OneRx, they can accomplish these tasks in an instant.